How Al DeLorey came to be the "Felonious Golfer"
Directions to make and use one of these yardage books! 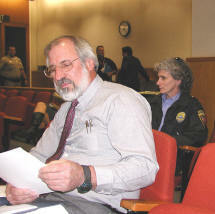 In January of 2003 DeLorey was at the Ventura County Court House to observe the procedures of a Judge, Art de la Torre, who would be handling his upcoming misdemeanor court case. While Judge de la Torres court was in recess, DeLorey decided to watch the murder trial of Andrew Luster. During a recess he was chatting with another spectator who turned out to be the court reporter for the Ventura County Star. DeLorey told the reporter why he was at the courthouse that day-- that he would be defending himself on the charge of violating Oxnard city code 20-6 and was scheduled to appear before Judge Ruben de la Torre on February 4. 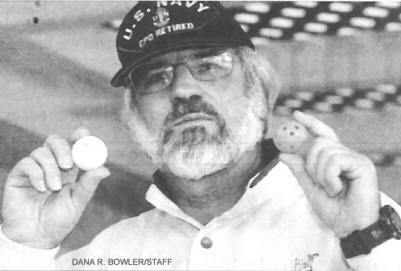 Once DeLorey told the reporter that he was indeed practicing golf in the park but was only hitting wiffle balls, the Star reporter thought DeLorey's story would make a good subject for columnist Colleen Cason. On January 16, 2003, Mr. DeLorey received a call from Ms. Cason. She asked if she could come to his house, along with a photographer, and interview him about his upcoming trial. 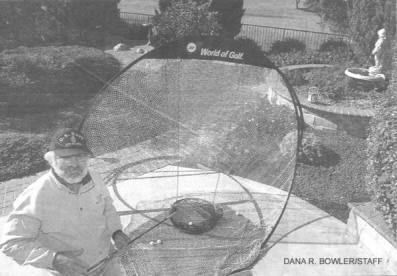 The interview was held, photos were taken and on January 19 the column entitled "Golfer Keeping His Eye on the Ball" (see column below) appeared in the Star. 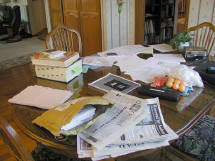 After the trial Ms. Cason reported on the outcome of DeLorey's trial in her column titled "What's Scary and What We Should Fear." (See column below) DeLorey was "acquitted on all counts" but he still has a misdemeanor arrest record due to hitting wiffle balls in Connelly Park, Oxnard. Humorist Mark Twain defined golf as "a good walk spoiled." Webster's Dictionary defines it as "an outdoor game played with a small, hard ball and a set of clubs." In December, DeLorey was charged with playing golf in a public park. Listed under Miscellaneous in the Oxnard City Code, it is a misdemeanor punishable by a fine and no more than a year in the county jail. Who knew? Use a Callaway, go to jail. However, the 59-year-old retired electrical engineer denies he was playing golf. Yes, he was in a public park, and, yes, he was swinging a golf club. He maintains he was not playing golf because he was not hitting a hard, little ball. He was using a Wiffle ball, a lightweight plastic orb with dozens of tiny holes. It is a sphere so aerodynamically dysfunctional Tiger Woods could barely knock it the length of a Buick. DeLorey's brush with the law started when he was practicing his swing in an unoccupied neighborhood park about a nine-iron-shot from his Oxnard home. Golf is an equipment-intensive sport and so he lugged a few clubs and a fake turf mat so he would not kick up divots. He was armed with 50 Wiffle balls. Two officers responded and indicated it was their opinion DeLorey was violating the code. He argued his case and the officers left. Convinced he was doing nothing wrong, he continued to practice in the park with the plastic balls. Convinced DeLorey was a menace to public safety, the citizen kept complaining. At one point a code-enforcement officer arrived. 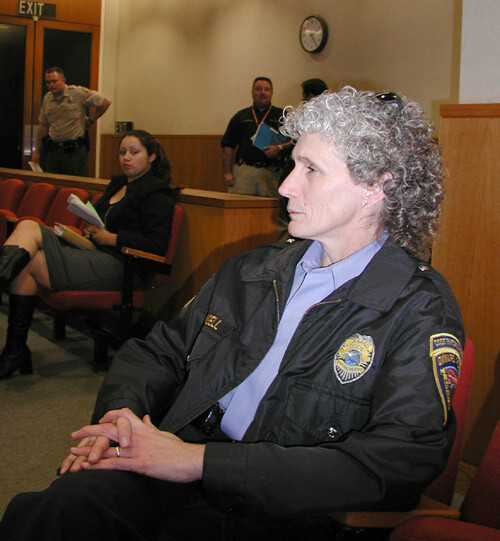 Armed with a condensed book of Oxnard codes, she ruled plastic balls were allowed. Days later, the spoilsport phoned in another complaint and a police officer came to cite DeLorey for misdemeanor hacking. His case will be heard in Ventura County Superior Court next month. This tees off DeLorey, so his dining room table has become headquarters for his defense in the case of the People v. DeLorey. The case already has cost him a lot of green. He purchased calipers to measure the diameter of the Wiffle ball and a regular golf ball. He ordered 19 copies of the U.S. 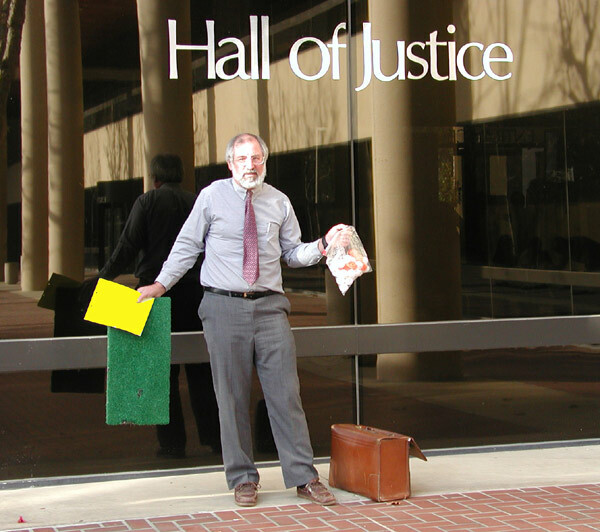 Golf Association handbook so he could hand them out to jurors should his case go to trial. He believes his innocence is proven by the USGA handbook. As Mark Twain also remarked, "Principles have no real force except when one is well-fed." When it comes to the determination of one Albert DeLorey, Oxnard officials can consider themselves "fore!" warned. 02042003 14 Court acquits the defendant of all counts. You will be glad to know, however, the world is again safe for duffers. On Feb. 4, Oxnard resident Al DeLorey was found not guilty of misdemeanor playing golf in a public park by Ventura County Superior Court Judge Ruben de la Torre. You may remember my Jan. 19 column in which I wrote about DeLorey being cited for slicing at plastic balls in a neighborhood greenbelt. De la Torre ruled Wiffle balls are not a public danger. Finally, something we can live with. -- Colleen Cason's e-mail address is ccason@insidevc.com. Her telephone number is 655-5830. You don't need me to tell you we live in dangerous times. The purportedly peace-loving Swiss have armed the world with those knives of theirs. Used properly, the red-handled utensils can perform great service to mankind -- like plucking nose hairs and replacing eyeglass screws. You don't, however, want to leave one unsheathed in the baby's playpen. What works in an adult's hands doesn't always cut it when used by a child. Secretary of Homeland Security Tom Ridge got himself into a sticky situation recently by urging Americans to stock up on duct tape and plastic drop cloths. In the event terrorists release chemical or biological agents, he said, these common items could be used for so-called "expediency sheltering." The idea is to seal yourself in an interior space so outside air can't permeate it. Ridge doesn't say, however, just how long before a human being blows through all the oxygen in a walk-in closet. And is duct tape's adhesive resistant to, say, mustard-gas fumes? I smell a big federal grant for some biochemist. But it isn't just adults the government is advising to duct and cover. The Federal Emergency Management Agency has suggestions to empower our kids in the event of the unthinkable. FEMA officials are telling youngsters chemical and biological attacks can come from "bombs sprayed from the air or used as a liquid to create a hazard to people and the environment. Some chemical weapons may have no smell or taste." And in case this frightens the child, FEMA offers these encouraging words: "It's important to know chemical agents are deadly but very difficult to deliver and produce." Deliver to a kid means the guy in the beat-up Datsun who shows up with a pizza. FEMA explains to the children how to seal themselves in a room and tells them to be sure to take a battery-powered radio along so authorities can tell them when it's all clear. Have these people not read the instructions on a dry-cleaning bag? You know, the warning about keeping thin sheets of plastic away from children so they don't suffocate. Somehow, I think we owe kids more peace of mind than this. If Osama bin Laden had a sense of humor, he'd probably be laughing his gutrah off at the thought of a government with the most powerful arsenal on Earth trying to keep its citizens safe with stuff from Home Depot. Or maybe it isn't all that funny. After all, his operatives brought down the World Trade Center with an item that can be bought at a hardware store -- box cutters. To me, the scariest recent news item was not that our government considers duct tape the last line of defense. It's that a judge ruled the last line of defense in an airplane hijacking can fly high. Last week, Judge Norman Thomas acquitted Delta Airlines pilot Gary Schroeder of being under the influence while piloting an airplane. Schroeder was taken off the jetliner he was about to co-pilot after a baggage inspector smelled booze on his breath on the day after Christmas. Schroeder's blood alcohol level was 0.07 -- just a thimble under the legal limit for driving a car. Thomas determined Schroeder was not impaired. It's hard to keep up with the homeland security news, but you may recall a law was passed that permits pilots to carry guns so they can thwart hijackings. Somehow, I find it cold comfort that a pilot can fire a pistol after he's had a couple of cold ones.